Thomas Jefferson, Founding Father and third president of the United States, began construction of Poplar Forest in 1806. It was a retreat and the purest of his Neoclassical architectural masterpieces. He visited the house in the foothills of the Blue Ridge Mountains as often as four times a year, frequently staying as long as a month. Its elegant geometrical design and unusual, somewhat impractical plan embodied the abstract forms that architects of the Neoclassical loved. Poplar Forest, set in its carefully planned landscape, was a personal architectural creation and the place where Jefferson found rest and leisure and enjoyed private time with his family. Thomas Jefferson long dreamed of a quiet retreat where he could get away from the pressures of public life. His long and distinguished political career kept him from realizing his dream until late in his presidency. Jefferson acquired the 4,800-acre plantation at Poplar Forest through his marriage to Martha Wayles Skelton in 1773. During the Revolution when the British drove him from Monticello in June 1781, he escaped with his family to Poplar Forest, staying in the only dwelling on the property, the overseer's house. During a visit in 1801, a rainstorm left him cooped up in the overseer’s house with numerous children and dogs. Jefferson spent his time— in what was undoubtedly a cramped and noisy setting —computing how long it would take to pay the national debt. According to tradition, it was then that he began to realize the advantages of building a more tranquil place for himself. 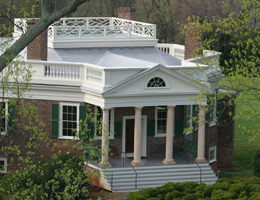 Thomas Jefferson designed and built this architecturally notable house between 1806 and 1823. Jefferson was a brilliant self-taught architect, considered by many to be America’s first. Octagons fascinated him. Poplar Forest was one of his many octagonal designs and the only octagonal house actually built. The one-story brick residence is set on a high basement. The front and rear elevations are strictly symmetrical and feature Classical porticoes with pediments and four Tuscan columns. The plan is an equal-sided octagon that reflects Jefferson’s passion for geometry. 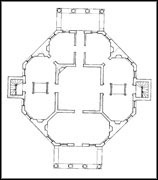 On the interior, four elongated octagonal rooms surround a central chamber illuminated by a large skylight. This central space is a perfect cube, measuring 20 feet in all directions. Jefferson liked octagonal rooms in part because they allowed for more light, especially important in a time prior to electricity. The abstract symmetry of the house extended to the landscape as well. Two artificial mounds on either side of the sunken lawn behind the house served as ornamental elements and screened identical octagonal privies. The villas of Renaissance architect, Andrea Palladio, influenced the design, with the mounds replacing pavilions. In 1812, Jefferson proudly declared, “When finished, it will be the best dwelling house in the state, except that of Monticello." In 1814, Jefferson added a service wing where slaves did the work necessary to maintain the house. Approximately 94 slaves worked on the plantation. Letters and documents, as well as excavations of the slave quarters scattered about the property, provide glimpses into their lives. Slaves at Poplar Forest performed a variety of jobs, including fieldwork, road building, livestock tending, brick-making, blacksmithing, woodworking, carpentry, masonry construction, weaving, and spinning, as well as service in the house. 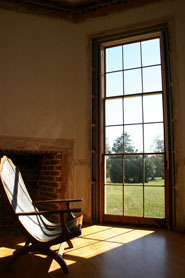 A replica campeachy or "siesta" chair, favored by Jefferson. Jefferson kept to a regimented daily schedule for most of his life, and the time he spent at Poplar Forest was no exception. An early riser, he spent the mornings riding, reading, or writing. He maintained a library of more than 1,000 books in many languages. When his family accompanied him to Poplar Forest, they dined early and read or strolled about the gardens in the evenings. Jefferson loved spending time with his grandchildren. Jefferson’s grandson, Frances Eppes, inherited 1,074 acres and the house at Poplar Forest but sold it only a few years later. In 1845, a fire destroyed the roof and interior, leaving only the basic shapes of the rooms, four chimneys, and the portico columns. Later families modified Jefferson's villa retreat into a home more suitable to their needs. Organized in 1983, the Corporation for Jefferson's Poplar Forest bought the house and 50 acres of land in 1984. The corporation opened the house to the public two years later and began to make plans to restore the house and landscape to its appearance during Jefferson’s lifetime. The restoration work on this National Historic Landmark is extraordinary. Jefferson designed and built his retreat solely to suit his "fancy," and ongoing restoration and archeology efforts give unique insight into his life and creativity. Poplar Forest is located on Rte. 661 (Bateman Bridge Rd.) at 1548 Bateman Bridge Rd. southwest of Lynchburg, VA. It has been designated a National Historic Landmark. Click here for the National Historic Landmark registration file: text and photos. An admission fee is charged. Poplar Forest is open for tours and special events, seven days a week March 15 through December 15. Tours of the house are offered from 10:00am to 4:00pm each day. Poplar Forest is closed on Thanksgiving Day. For more information visit the Poplar Forest website or call 434- 525-1806. Poplar Forest has been documented by the National Park Service’s Historic American Buildings Survey.